The chimney was designed to carry off smoke from the fireplace and also to maintain enough draft to provide oxygen to feed the fire. This may seem like an obvious concept to our modern minds, but, like every other object and modern convenience we possess today, it wasn’t always that way. Let Milwaukee's best chimney sweeps tell you the tale! The Romans first understood the benefits of building a fireplace and vents for cooking and heating. Primarily used in bakeries, chimney-like vents were dug out of these establishments to vent smoke. Bakeries used the most heat in a day compared with other occupations. In Northern Europe, Anglo, Saxon, and Celt houses were filled with smoke. Ancient Scottish “Black Houses”, some of which still stand today, are named for the smoke seeping from their chimney-less roofs. After the Norman Invasion in 1066, two-story houses began to emerge. The previous method of centering the fire pit in your thatch hut and venting the smoke through a hole in the roof would no longer suffice. Thus, the chimney we recognize today was constructed in these stone homes. After the Great Fire of London that raged from September 2nd-5th, 1666, new building regulations designed to keep the city safer were put in place. Fireplaces had to be built a certain way with narrower chimneys and it became apparent that chimneys needed to be kept clear of obstruction. Chimney Sweeps have been doing the essential dirty work ever since. Keeping your chimney clean is absolutely necessary for safety and efficiency. Why are Sweeps often seen wearing a Top Hat and Tails? The story behind the dapper outfit is a bit more morbid than one might expect; clothing was difficult to come by at the time, even after the Industrial Revolution and the invention of the sewing machine. Cleaning chimneys is a dirty job, and garments worn in the process did not last long. The cheapest available clothes on the market came from the undertaker in those days. You can probably guess from whence they came. Why do British brides invite Chimney Sweeps to their weddings? 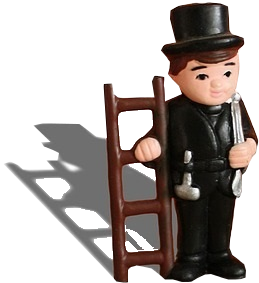 In the UK and parts of Germany, Chimney Sweeps are considered to be excellent luck. This bit of folk lore originated in the 1700s when King George was riding his horse in a processional and suddenly it was spooked by something in the crowd. A Chimney Sweep rushed forth from the crowd and calmed the horse, even though he could have been seriously injured. Ever since, the tale has developed into a firm association between the Chimney Sweep and vitality. Some Sweeps even hire themselves out as wedding guests for betrothed couples who do not yet employ their own. Chimneys and the people who sweep them are a fascinating and time-honored practice that is just as necessary today as it was 400 years ago. Read the fascinating story of how our very own Jeff Schmittinger and his crew pay their own way to Washington DC every year to clean the White House chimneys. Contact the best Wisconsin Chimney Sweeps today for a cleaning (or to invite us to your wedding).